On another blog, which I frequent, there are regular photography 'assignments' and prizes for the photos chosen. Many people have been stating that they "cannot compete" because they "only have a point and shoot camera" or they can't take good photos because they "can't afford a DSLR". Many other people have responded that it's not the camera that makes the photo, but the photographer, which I completely agree with. The best quote I read there was, "The best camera is the one you have with you." This is so true. You have to work with what you have. If you want to be a photographer, you utilize the camera you have, and you practice, and you learn. Take photos of EVERYTHING from the sky to the garage floor. My point is... having a professional camera does not make a person a professional photographer. So, this conversation, and the fact that this is my 1000th POST, prompted me to reminisce and go through some of my photos from pre-DSLR times. I decided to use one of those photos for this week's Looking at the Sky on Friday. This photo was taken during the vacation we took my step-daughter on as her high school graduation present. P.S. Sometime this weekend, there will be a giveaway posted on this blog to celebrate my 1000th post. Be amazed at what even a cell camera can do these days. 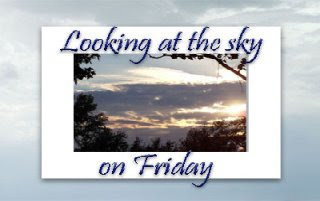 Keep looking a the sky on Friday! 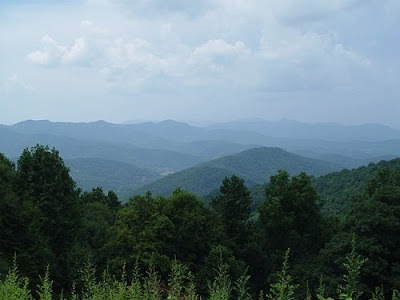 Almost looks like the Smokey Mountains there. Nice shot. You are correct. The best camera is the one you have with you. And congrats on 1,000 posts. That's quite a journey and you deserve a pat on the back! 1000 posts. Wow! I always forget to keep track of mine. I guess I should go look and see how many I've done. Lovely picture, and I do agree. It's not the camera, it's the operator. The camera only captures what you tell it to. Hey PW... You Ever Had a Sink Full of Em??? Corny Captions Shirts? What'cha think?